A monument to William Cargill, leader of the Free Church migration to Otago and first superintendent of the province, was put up in Dunedin in 1864, four years after his death. The monument was first erected in the Octagon but was moved to the Exchange in 1872. 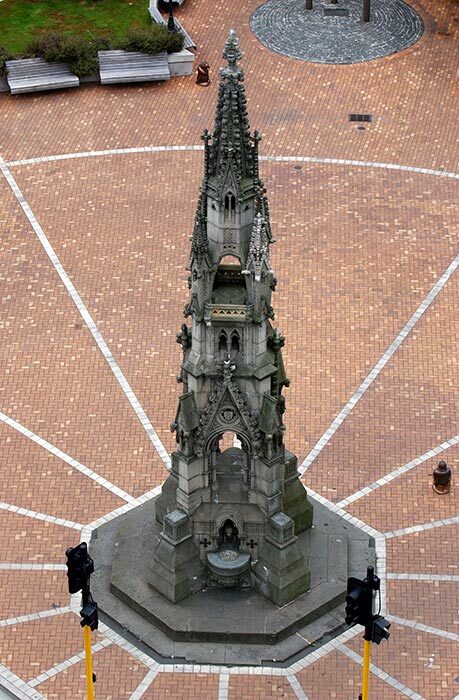 It was not a statue but a Gothic revival spire, and it had other intended functions besides remembering Cargill – it was planned as a gas lamp, a drinking fountain and a viewing platform in the middle of a garden. However, the garden never came about, the drinking fountains were not connected, and in the early 2000s the memorial no longer served to provide light.